Three goals in eight minutes set Glasgow City on their way as they swept aside Spartans on their return to Petershill Park. Abbi Grant scored a double in the opening few minutes before Noelle Murray soon tapped in a third. Hayley Lauder and Leanne Ross added further goals to keep City two points clear at the top. Second-placed Hibernian beat Stirling University 2-0 ahead of their trip to face City on Thursday. Elsewhere in the Scottish Building Society Scottish Women's Premier League, Aberdeen were denied a first win of the season by a late equaliser as they drew 2-2 with Rangers. Celtic moved back to third with a 4-0 win away to Hamilton Academical. It is going to be a huge few weeks for City, with Thursday's top-of-the-table meeting with Hibs the start of a run of games that include a trip to Kazakhstan in the Champions League and a Scottish Cup semi-final with Forfar Farmington. If they wanted this game out of the way quickly then they wasted little time in putting it to bed in their first game after moving from Airdrie back to their previous home in Glasgow. Grant hit the net twice in the opening five minutes with two simple finishes from close range. Eight minutes in and it was 3-0. Noelle Murray tapped into an empty net after goalkeeper Rachel Harrison had palmed Grant's shot into her path. Hayley Lauder was determined to get in on the act, shooting wide then having another effort saved a minute later. And, on 33 minutes, she finally made her mark, firing in off the inside of the far post. Spartans had climbed to third thanks to their recent run, but it was desperate stuff for the visitors as they were run ragged. However, City's fifth goal was out of the top drawer. Leanne Ross started the move in midfield, burrowed forward after playing the ball wide to Katie McCabe, then was in the box to collect the pass and add a sublime finish. City head coach Scott Booth made four changes at the break with Thursday night in mind and inevitably the pace of the game slowed, although City continued to dominate. Lauder and Jo Love both hit the bar as City spurned chances to increase their lead. They finished the game with 10 women after Sam Kerr was carried off following a clash with team-mate Love. 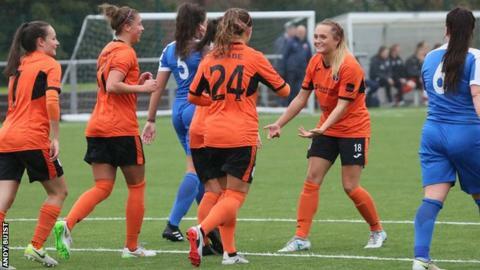 Glasgow City head coach Scott Booth: "We started with a really good tempo. We did that against Jeanfield as well but didn't score in the early part of the game. "But we played the same way and today it was good that we took our chances early. "I'm gutted because Sam Kerr has picked up an injury there that looks fairly serious at this moment. "She's taken a really sore one to the ankle and we just need to get her to the hospital and make sure there's nothing overly serious first before we can start assessing where she is fitness wise. "It was nice to play at Petershill today. It's a good surface that allows us to pass the ball and that works for our game."